2017 NHL Entry Draft: Who Could the Montreal Canadiens Select with Each Pick? Last year, the Montreal Canadiens walked away from the first round of the draft with what many believe is the best defenseman in the class. In Mikhail Sergachev, the Habs have a bonafide blue-chip prospect – something the desperately need. Recent picks Noah Juulesen and Michael McCarron are nice players but are not guys that will ever live up to the ‘first rounder’ label. 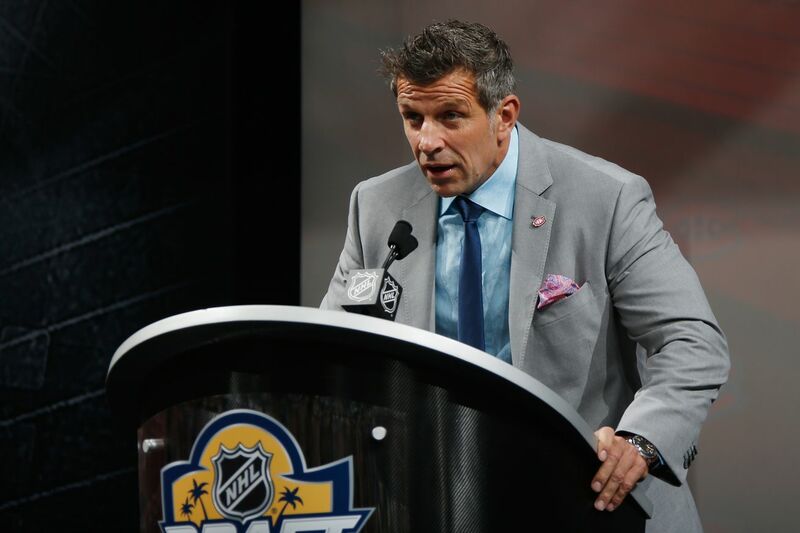 This year, drafting at 25th overall, it’s going to be interesting to see which direction the Canadiens go – given the parity in this draft, it’s not unlikely that there will be a number of very good players available at that spot. Last year, Bergevin and crew took fliers on a couple of very high-risk guys in Victor Mete and William Bitten – Mete has likely exceeded expectations while Bitten had a season that was likely pretty disappointing for fans of his. It would not be surprising for the Habs to take the same approach this season. They currently only have five picks, so trying to hit a home run on riskier picks might be in the cards again. Luckily, four of those five picks will land in the top-87 of the draft. Here are some possibilities for each of the five picks the Canadien’s currently have in this year’s draft. Robertson is a very interesting prospect. He is a guy that is ranked all over the map, with some believing he’s got potential to be an absolute steal at the end of the first round. What kind of player is Robertson? He’s a scorer, plain and simple. With 42 goals in only 68 games this season, put him tied for sixth in the OHL this season – only two behind consensus top-10 pick Owen Tippett. What makes Robertson’s goal total most impressive is that he was playing with very little fire power around him. Kingston was by far the worst offensive team in the OHL – Robertson’s 42 goals were 24% of his teams total for the season. What makes some shy away from him as a prospect is his skating ability – something he has worked hard to improve since starting his junior career. At 6’2, 200lbs, Robertson is a big winger with a great shot and while it’s not much above average, his skating has improved to a level that is more than passable in the NHL – for example, he’s a much better skater than Matthew Strome who is also a big winger that will be drafted in the same range. I have a more in-depth look at Robertson here. Once viewed as a first-round pick, Chmelevski did not take the step some expected this season. He was the key piece going back to Ottawa in the Travis Konecny trade a year ago and many think he still has the potential to be one of the best in the league. The native of Huntington Beach, California finished the season with only 43 points, but throughout the season he showed flashes of the kind of high-end talent he possesses. He is a strong possession player that has great vision and playmaking abilities. Add to that a high-end wrist shot and you’ve got a very good offensive threat. His biggest problem is consistency. If he ever puts it all together, watch out. Chmelevski could end up being much more valuable than the late second round pick the Habs would spend on him. Other possibilities: Scott Reedy, Morgan Frost, Alexy Lipanov. Having drafted Mete last year, it’s obvious that the Canadien’s have no problem selecting undersized defenseman with great puck skills. Farrance is a fast, puck-rushing defenseman that is great at leading a breakout with the puck on his stick. He is going to Boston University in the fall and has the potential to be very good, very quickly. Here is a longer look at Farrance. When Michael Rasmussen got injured, Kyle Olson was given the opportunity to move to center and inherit more ice time – the results were outstanding. The tenacious forward plays the game a lot like another undersized forward from Alberta **cough Gallagher cough**. While playing center, Olson was able to show that he can be a very defensively responsible player. He is tough to play against in all three zones and is rarely caught missing an assignment. He plays with a lot of grit, but is going to have to put on some weight to play the same style of game as a pro – he’s only about 150lbs right now. Olson is a very intriguing prospect that would be well worth a third round investment – something that you can see with his deeper look into his game. Growing up in the Malmo Redhawks system, Sylvegard got his first taste of professional hockey this year, playing 14 games in the SHL as a 17-year old. He didn’t score any points, but the fact that he even got into games with the senior club at his age is a good sign. He is a heavy winger that had a good showing at the Ivan Hlinka Memorial Tournament last year. He’s hard to knock off the puck and does a very goos job of winning battles against the boards. He might be a long shot for the NHL, but he’s got the style of game that could translate into a decent depth pro in North America. Sylvegard would be a pick to stash in Europe without a contract and hope that he develops well over the coming years. The name of Montreal’s manager is Bergevin not Bergeron. Aside from that predicting draft choices is a crap shoot. No one knows and a million articles can be written about them.